There are other Washington Townships in Michigan. Romeo is a village in the northeast corner of the township. Most of the village is in adjacent Bruce Township. 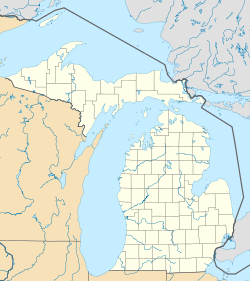 Washington is an unincorporated community in the south central portion of the township just west of M-53 at 42°43′28″N 83°02′10″W﻿ / ﻿42.72444°N 83.03611°W﻿ / 42.72444; -83.03611. Located at the intersection of North 26 Mile Rd. and VanDyke Ave. According to the United States Census Bureau, the township has a total area of 36.8 square miles (95.3 km²), of which 36.0 square miles (93.1 km²) is land and 0.9 square mile (2.2 km²) (2.34%) is water. Weather in Washington Township (an outer suburb of Detroit) is similar to Detroit, generally being only a few degrees cooler allowing for more snow in the winter. As of the census  of 2010, there were 25,139 people (up from 19,080 in 2000), 9,258 households, and 7,160 families residing in the township. The population density was 699.2 per square mile (270.0/km²). There were 9,258 occupied housing units and 612 vacant units. The racial makeup of the township was 94.8% White, 1.6% African American, 0.2% Native American, 1.0% Asian, 0.04% Pacific Islander, 1.0% from other races, and 1.3% from two or more races. Hispanic or Latino of any race were 3.9% of the population. There were 9,258 households out of which 32.9% had children under the age of 18 living with them, 64.9% were married couples living together, 8.9% had a female householder with no husband present, and 22.7% were non-families. 19.2% of all households were made up of individuals and 7.6% had someone living alone who was 65 years of age or older. The average household size was 2.70 and the average family size was 3.11. In the township the population was spread out with 25.0% under the age of 18, 7.3% from 18 to 24, 23.3% from 25 to 44, 30.3% from 45 to 64, and 14.1% who were 65 years of age or older. The median age was 41 years. For every 100 females, there were 97.8 males. For every 100 females age 18 and over, there were 94.7 males. The median income for a household in the township in was $68,841 in 2000 and $83,348 in 2016; the median income for a family was $78,988 in 2000 and $94,057 in 2016. In 2000, males had a median income of $60,721 versus $31,213 for females. The per capita income for the township was $38,657. About 5.7% of families and 7.1% of the population were below the poverty line (up from 2.8% of families and 3.7% of all individuals in 2000), including 9.6% of those under age 18 (up from 5.0% in 2000) and 5.9% of those age 65 or over (up from 2.7% in 2000). ^ "Macomb County School District Map" (PDF). Michigan School District/County Series. Michigan Department of Information Technology. March 2008. Retrieved 7 February 2012. ^ [ Tornado History Project, T | date=May 2014] "Tornado History Project: Tornado 19970702.26.16". Retrieved 2014-05-10.